SEAT has unveiled a prototype plug-in hybrid version of the Leon, designed as part of a four-year research project to facilitate the introduction of an electric vehicle to the Spanish market. The Leon ‘Verde’ (green) is powered by the combination of a 122PS 1.4 TSI engine and a 102PS electric motor. That combination means that on the official EU combined cycle test the Leon Verde delivers 176.6mpg and emissions of 36g/km, plus it can travel up to 31 miles on the electric motor alone. With a full battery and a full 40-litre tank of fuel it has a maximum range of 507 miles. The Leon Verde is equipped with smartphone connectivity which allows the user to manage functions and monitor the status of the cars batteries and range remotely via their mobile phone. There’s also a system to monitor the driving style of the driver and use the data to maximise economy. 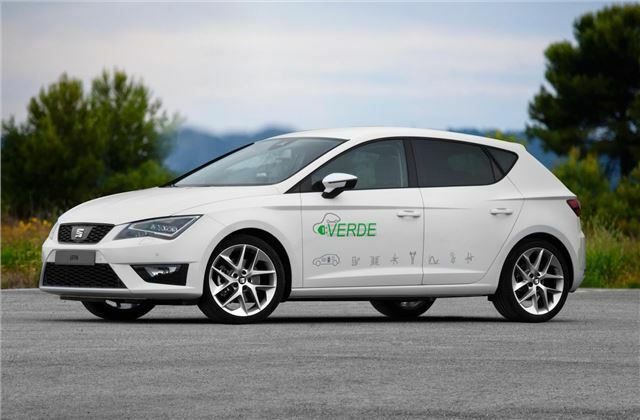 SEAT has worked with Spanish energy suppliers to come up with a more economical way of charging – the car monitors demand on the grid and prioritises its charging based on demand from the grid. This saves the user money and reduces load on the electricity grid. Additionally there is a fast charger to use when you need power quickly rather than cheaply, plus the Leon Verde can supply electricity to the home if needs be. Again, this can save the owner money if they draw power from the grid when it is cheap and use it at peak times. There are no plans to put the car into series production, but much of the technology will be adapted for use in future production models.